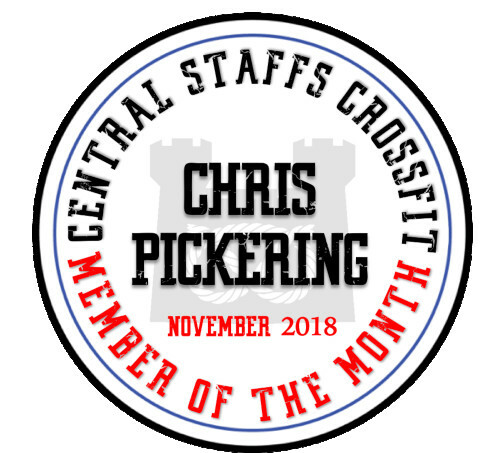 Chris Pickering has been a member at Central Staffs since April 2016. Chris joined doing 2-3 sessions a week initially improving on his already established base of fitness. He took cues from the coaches and worked on the specific movements to Crossfit, gymnastics and Olympic lifting. He his always a pleasure to coach and been on a session with he’s encouraging to other members and always offers a supportive shout or high five. He also mixes up the classes he does, from conditioning to the speciality classes. Chris well done and keep up the good work. We will start this month by letting you know about our Christmas activities and closures. We are permanently moving our free Hero WOD’s to 17:00hrs on the last Friday of every month. After moving this a few weeks ago, we have seen a much bigger turn out, which is always fantastic to see. So from now on the Hero WOD will be held at 17:00 on the last Friday of every month. To book onto Novembers Hero WOD see the link below. As our long serving members will know, every year we like have a bit of fun and bring the community together to see out the year. This year is no different and we will be holding a “FANCY DRESS” Christmas WOD. As always we would like you to make an effort, but so not as to exclude anyone, it is optional. The WOD will be fun and all inclusive so sign up and come and train with members of the community who you may never have seen before. On the 28th December we will be holding a 24hr charity WOD in aid of BloodBike and #PennysArmy. Rich Bell, has taken upon himself to give something back and has volunteered to start a workout on the hour every hour from 9am -9am. Now, we won’t lie, we are out to raise as much money as we can for Penny, and Blood Bikes so here is where we need your help. We want as much support as we can, this can be getting sponsored to accompany Rich in his epic task, making food for the event, Supporting, sharing our just giving page, inviting as many cross fitters as you can to take part and donations. We are a huge community, a family, and one of our own needs our help. We have set a £2000 target which will be split equally between Blood Bikes and #Pennys Army. Lets see if we can smash that target. As mush as we don’t like closing, we also advocate spending time with family, resetting and relaxing during the Christmas period. Its one time of the when our coaches can take some time and members can take some forced rest ready to face the new year with passion and new goals. We will be closed on the following dates so please add these to your diary. We wanted to remind you about the necessity of warming up prior to training in the winter months. We often see people attending the workouts and jumping straight into the Class in the hope the accessories or skill work will be enough. Accessories and skill work is NOT your warm up. Our programming incorporates accessories and skill work for you to get the benefit out of the movements and instruction, for this to be effective we need your heart rate elevated, muscles and ligaments to be prepared and blood flowing around your body. When you get to the box, if you are cold, don’t stand around waiting, grab a buddy, or the nearest person to you and jump on an Airdyne, SkiErg do 10-15 calories. Follow the warm up whiteboard and get moving. This will significantly increase your performance in the WOD and help you get warm. In the darker weather keep onto of your vitamin D it helps with mood and motivation. We just wanted to make you all aware of some tremendous efforts made by a couple of our members. Firstly, Tracey Birchall took on the Birmingham marathon and finished it in an impressive time. Trace has worked hard to accomplish this, and did it with a smile on her face too. Well done Trace. Next we wanted to recognise Danny Gratton who took part in the 12k run in Erbil Northern Iraq. Danny did the run to support local people in tourism after ISIS and war. The run also supported women freedom to run. Its always good to see people doing something in aid of others, and if it involves fitness on any level it makes us proud. Great Work Danny. U.S. Army First Lieutenant Daren M. Hidalgo, 24, of Waukesha, Wisconsin, assigned to 3rd Squadron, 2nd Stryker Cavalry Regiment, based in Vilseck, Germany, died on February 20, 2011, in Kandahar province, Afghanistan, from wounds suffered when insurgents attacked his unit with an improvised explosive device. Two weeks prior to his death, he was hit by an earlier improvised explosive device. Despite his injuries, he stayed in country and on patrols rather than return home.